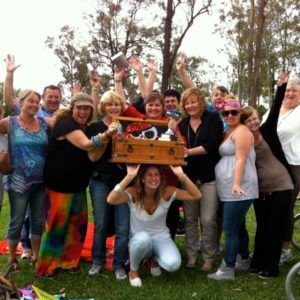 Brilliant fun Beach games & events for groups, team building and conferences on beaches along the East Coast of Australia. 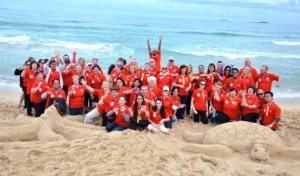 Beach activities, games, and corporate team building events on the worlds best beaches of Manly, Bondi, Coogee Beach, Gold Coast Surfers Paradise. Sand sculpting, beach volleyball, beach cricket and ironman Olympic beach events. Enquire now 02 9871 3333. Experience the best Corporate Beach Games, Mini Olympics Events, Sand Sculpting or Beach Volleyball, Beach Cricket on all Beaches around Sydney, Central Coast and The Gold Coast site of the Commonwealth Games 2018. 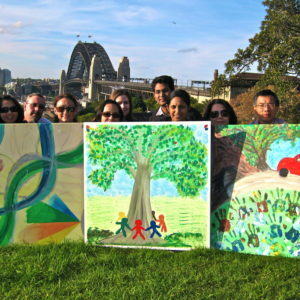 Designed for corporate and business groups to achieve success together through fun and healthy active participation. Enjoy fun in the sun with a series of beach activities and games, Olympic events, sand sculpting, treasure hunts or a grand championship game of beach volleyball! Experience a variety of games on Sydney, Manly, Bondi, Tamarama, Coogee Central Coast and Gold Coast Beaches. Ideal summer events and conference team break out activities extravaganza! Formatted as a round robin of beach games, team building events, or ironman games. All teams participate to the best of their ability as cheers and laughter erupt! Relive these moments with fantastic professional photography. 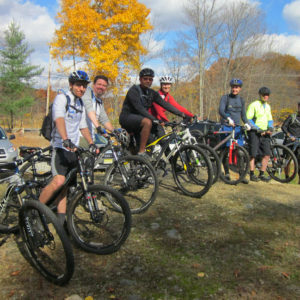 Bushsports develops all events cooperatively with you ensuring your organisations’ employees have an excellent time. Create themed team names, with everyone receiving colour-coordinated bandanas. Excellent fun and laughs for teams rewarded with a winners Trophy. Sand Sculpting: Teams create a sculpture to be assessed and scored. Jaws Relay Race: Teams are timed as they race against each other. Run, jump or hop with inflated sharks, they must pass the sharks to their team mate without touching. Hula Hoop Aloha: Quoits Hula throw and then: Best of the best hula hoopers’ challenge rival teams in a timed hula contest. Great background music adds to the fun and excitement of this event. Life Raft Relays: Teams build and man their life rafts in an effort to move their team to safety. Raft Build: Design and build your castaway raft to escape the island – Wilson!. Beach Volleyball: Modified volleyball. 1, 2, 3 or as many teams as you like to keep the fun action flowing. Which can be hosted By Olympic Beach Volleyball Champion, Kerri Pottharst or other Olympians. Obstacle Courses: Bushsports designs obstacle courses in all locations. Participants make their way through the obstacles retrieving markers. Beach Treasure Hunts: Search for a real treasure chest on Manly, Bondi, Surfers Paradise or Coogee Beach. Use compass orienteering bearings and clues to reveal X marks the spot. Be a looting Pirates of the Caribbean corporate group and plunder the bounty! Beach Scavenger Hunts: Crashing waves have scattered many debris and artifact. Collect as many as possible and build a raft, shelter or signal a rescue. Beach Soccer Games: Fun corporate soccer games. Beach Cricket Games: Modified fun interactive Australian Beach Cricket. Survivor Challenges: Complete a fun Survivor team building program. Sydney’s Eastern Beaches to from Bondi to Maroubra or Northern Beaches from Manly to Newport and Palm Beach on some of the world’s greatest and best beaches!! It’s even better when a professional sand sculpturist demonstrates and shares the tricks of the trade with your teams. Bushsports sand sculpture staff encourage and facilitate teams building their own sand sculptures. During the sculpting team members learn to make the most productive use of their colleagues capabilities and qualities. Creative sand sculpture combined with team building promotes excellent teamwork. Teams’ results are appraised and the company enjoys viewing an entire sand sculpture gallery. Teamwork, creativity, and fun are the ingredients for sand sculpting activities with a collective result. The primary target is to initiate, develop and execute new methods of corporate training schemes. Sand and fun activities ideal to celebrate Christmas with a BBQ or Picnic suitable for all corporate groups, training programs and team building exercises. Take advantage of our free offers. Complete the online enquiry form to receive your proposal quote. CALL Bushsports Corporate Events team today on T 02 9871 3333.